In London, this time, we went to the source. The art-shows-open-to-the-public source, that is. 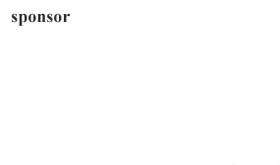 The source itself is unlikely. 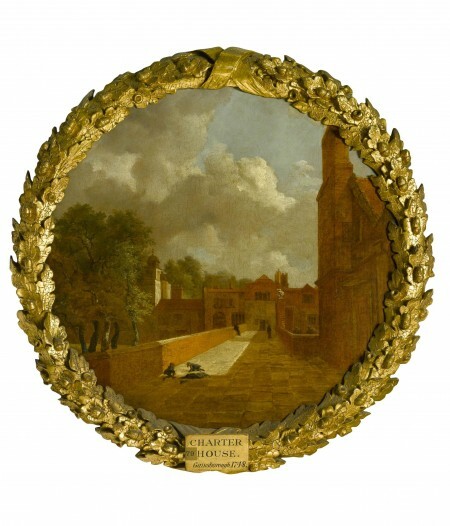 It’s The Foundling Hospital, established two hundred and seventy-five years ago to care for unwanted babies but not long after also becoming England’s first public art gallery. 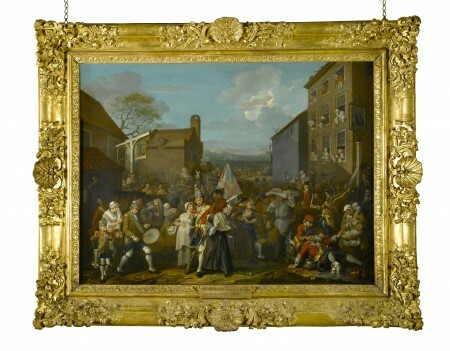 William Hogarth, that caustic observer of the kind of life that produces foundlings, made the Hospital an art show place as well as charitable institution with a gift of his paintings, plus other supportive actions, and encouraged fellow artists to do the same. 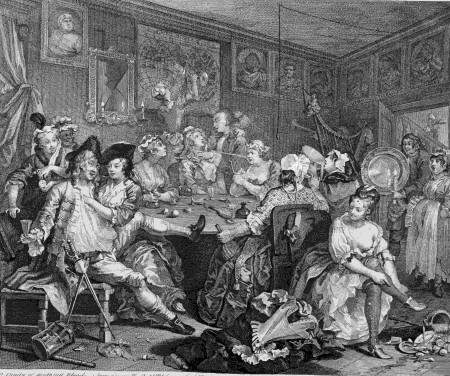 You can see work by Hogarth and his contemporaries at the Foundling Museum today. A temporary exhibition there now through September 7, Progress, presents three of today’s artists developing riffs on Hogarth’s “A Rake’s Progress,” which is also seen here in his own original 1735 prints. Progress, these artists suggest, isn’t so steady as we would like to think. 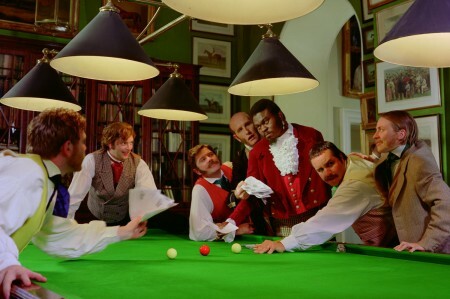 The modern works date from 1961-3 (David Hockney), 1998 (Yinka Shonibare) and 2012 (Grayson Perry). The most spectacular response is Perry’s stunning tapestry series, “The Vanity of Small Differences,” intricately detailed, very large works that document society’s excesses and effectively skewer the British class system. I’d not seen his work before. Shonibare, who is also new to me, brings a complicated background to his art with compelling results, judging from “Diary of a Victorian Dandy” in Progress. Born in London in 1962 of Nigerian parents, he contracted an illness at the age of 18 that left him partially paralyzed and de-railed his original art ambitions. 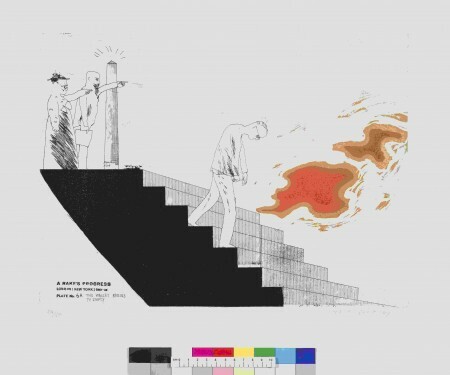 Despite this, he went on to art school and now functions as a conceptual artist in a wide variety of fields, supervising others carrying out his ideas. 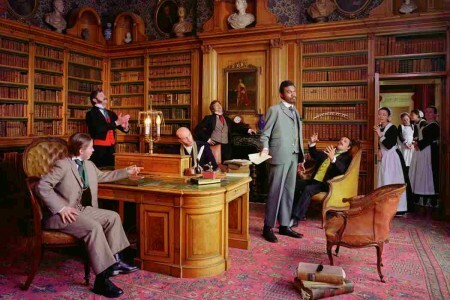 The “Diary. . .” at the Foundling Museum is a series of photographs, meticulously planned by Shonibare who also appears in them in period dress as the title character, morphed into a black Victorian dandy. Hockney’s series, now more than 50 years old, applies the Hogarth approach to his own experiences in New York City as a young, aspiring, gay artist in the early 1960s. 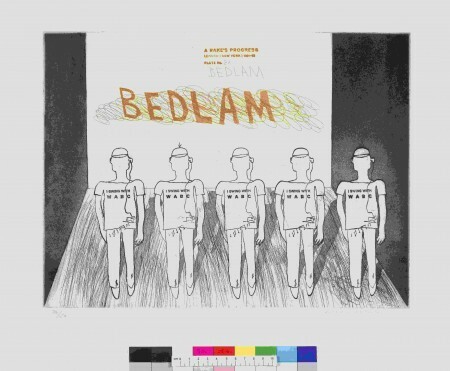 British-born Hockney called his series of eight etchings “A Rake’s Progress” in direct response to Hogarth and on returning to London added a further eight plates to the original group The entire series, shown here, takes its themes of youth, city, freedom and moral corruption to the same end as Hogarth with “Bedlam” as the final piece. The Court Room at the Foundling Museum, displaying works from the permanent collection, is presented as “one of London’s finest Rococo interiors” and is the next thing to over-done but settles as gorgeous excess. In white against green-painted walls and a white-on-white ceiling, the mantel piece and plasterwork come from the original building, dismantled for the current edifice. Many of the paintings there, by Hogarth and Gainsborough and others, in contrast to the setting, reflect hard times and hard lives in London. The Foundling Hospital itself, now the children’s charity Coram, is headquartered elsewhere but the Foundling Museum remains at the original site, 40 Brunswick Square, Bloomsbury. This is a yeasty location with interesting things within walking distance. We went from the Museum to Persephone bookstore, always a good destination. It’s at 59 Lamb’s Conduit Street and its mission is to “reprint unjustly neglected novels, diaries and cookery books from the twentieth century” mostly but not exclusively by women. The one that came home with me this time is Cheerful Weather for the Wedding by a Strachey I hadn’t previously heard of: Julia. Julia is an amusing writer and I enjoyed the book. It suggests the weather was more cheerful than the bride. Happily, if Mary Delany’s work were to be found on exhibition we had been told it would be in the Museum’s long Room 1, at the far right side of the front entrance. Here the 18th century’s “cabinet of curiosities,” in which dilettante collectors stored their interesting acquisitions, expands into a gallery-full of wonderful stuff. Cabinets of curiosities proved to be the seed from which museums themselves would grow, and in this room we see the kind of thing those endlessly inquisitive, happily well-to-do, fore-shadowers of curators kept on their shelves. 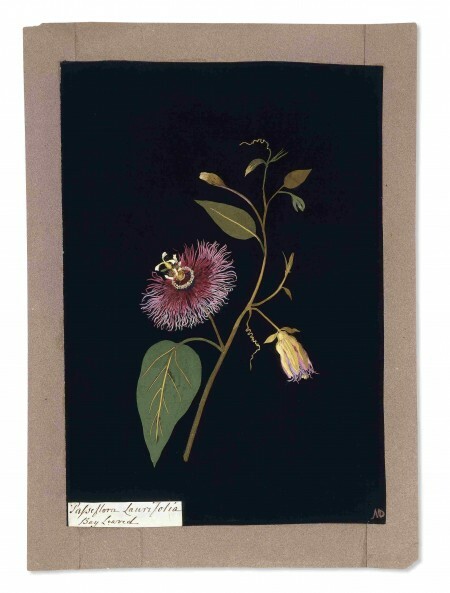 Our easily distracted little party took a long time to find Mary Delany’s flowers but did eventually. They are quite as delicate, precise and admirable as expected.. After that we called it a day. Another day, another paper cutter. The most popular show in London this summer, as it happens, is Henri Matisse: The Cut-Outs, at the Tate Modern through September 7. Unceasingly resourceful, Matisse turned a working tool into an end in itself as his physical condition made painting or sculpting less and less feasible. He had long used cut-outs of painted paper to experiment with relationships within his paintings and this exhibition, tracing his increasing pleasure in the form, suggests to me the possibility of their developing as they did whether or not he was painting. We see his skill expanding, more deft and more subtle, as the chronology unfolds. Cut-outs provide a suggestion of three dimensionality that captivated him and surely almost any viewer of this show. They also make possible re-arrangements without end – conservators, we learn from an exhibition label, counted more than a thousand pin-holes in the colored shapes of one work. This exhibition is an exhaustive study of its subject, filling fourteen galleries, but saved from over-kill by the vitality of the artist himself. 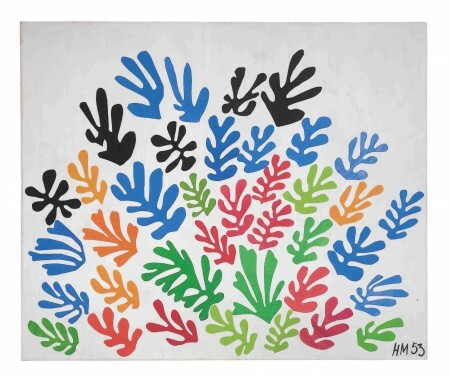 Matisse’s delight in making things communicates directly to the viewer. If the Matisse show leaves you with a head-full of color, as surely it must, the next place to go is the National Gallery. Making Colour is on view in the Sainsbury Wing through September 7, seemingly the cut-off date for almost everything in town. Color, so integral to so much art, has been achieved down the years by various methods from various sources. This exhibition looks into both the sources and the application, as well as side issues such as permanence and effect. Blue, elusive and desired, comes from lapis lazuli and also from cobalt salts; vermilion from cinnabar, later reds from cadmium, and so forth. This technical background is illustrated by splendid paintings from the Gallery’s collection and from other UK institutions and such intimate objects as Turner’s paintbox, found in his studio after his death. The final room treats of gold and silver, not found on the traditional color wheel but put to elegant use by generations of artists. We learn here that it’s not easy to guild a panel. The exhibition also provides insights on increasingly sophisticated possibilities of color in photography. Well chosen examples of color in art lift Making Colour from the possibility of foundering in too much technical detail. An equally interesting National Gallery show, also getting down to basics, is Building the Picture: Architecture’s Role in Italian Renaissance Paintings. If you don’t expect to be in London before it closes on September 21 but are intrigued by the subject matter see www.nationalgallery.org.uk where Building the Picture is detailed in an extensive on-line publication by that name. 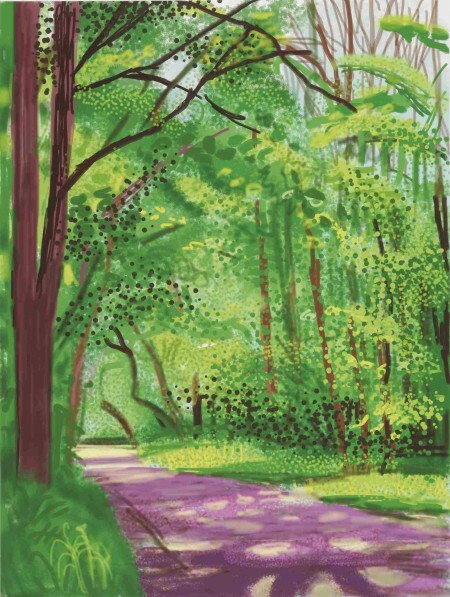 While I was in London but gone now was David Hockney: The Arrival of Spring at the Annely Juda Fine Art Gallery, 23 Dering Street. Echoing some of the themes of his 2012 Royal Academy exhibition, this show mixed charcoal drawings, iPad drawings, and the stately progression of nine truck-mounted video cameras moving down a country lane, each camera’s view unique in itself. The sky-lit gallery was a pleasurable setting for these engaging works, a reminder that the Hockney we saw at the Foundling Museum, bemused by New York, is never bemused by developments in available techniques and joyously – I am confident that’s the appropriate adverb – puts them to work. It’s no surprise that London is full of art. The interesting thing this time around was how frequently one thing led into another.